Polar bear lifts must be handled with great care. The morning clouds and fog lifted as afternoon arrived and the temperature plummeted to around 17 F. Slight winds persisted and the wind chill factor made it feel like below zero. With the weather changing to more winter-like conditions the bears were moving more out on the land. With all the bear sightings and encounters this past week, the compound was in need of releasing a bear or two on work release. In this case, the work would be traveling the 45 miles or so back from above the Seal River to the North. To that end, a “bear-lift” was scheduled for early afternoon. The compound area, roped off to the onlookers was abuzz with activity as two bears were wheeled out and placed in the nets readied for the helicopter. our groups watched with anticipation as the helicopter hovered in and landed. 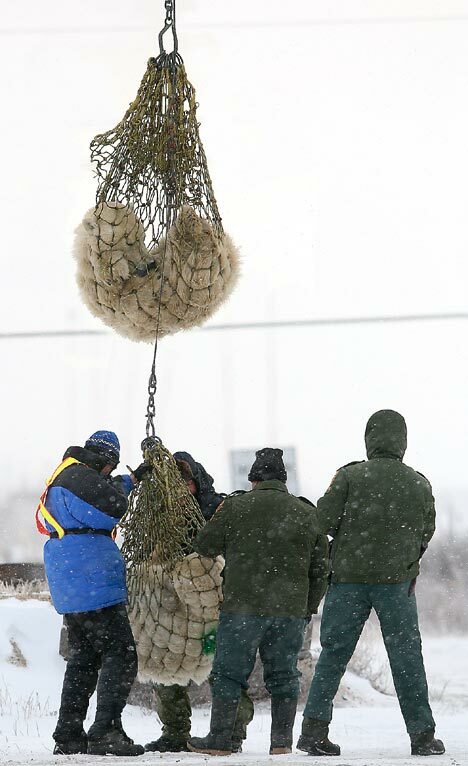 The nets were hooked on and in minutes the bears were airborne and moving North dangling from the chopper. cameras captured the incredible sight of bears in nets in the air. It’s an experience thrilling to all who witness and this one didn’t disappoint. amazing how some of the shortest experiences in life have the longest lasting impressions on our minds. On the tundra, the day was equally exciting. Guide Sandra and her group sighted bears before even boarding their polar rover. The first was at Camp Nanuk halfway to launch. The cottage compound is where Churchillians go to their cabins to get away from the hustle and bustle of the big city. The bear was moving toward the cottages away from the road and dogs were barking. As the group moved on, they caught glimpse of another bear just outside of the launch entrance in the willows. the actual tundra time measured up to the high expectations as numerous more bears were spotted including mother and cub and a mother and two cubs, a Short- Tailed Weasel and male polar bears chasing females and cubs on the inland road. The group finished up the prosperous afternoon by heading to the Tundra Lodge area where four to six bears were in constant view at any one time. Later in the day Guide Sue took her travelers out toward the Lodge while on their evening rover excursion. Once there they watched “Rocky” holding his ground as mothers and cubs tried to move in to the area. “Rocky doesn’t do a lot of chasing but he doesn’t give ground either. I guess a 900lb animal doesn’t have to. After a fabulous night on the glowing tundra, the travelers moved homeward under a nearly full yellow moon rising as a mother and COY moved off into the willows. My husband Bob is with the Maine Audubon group in Churchill now. Their last day on the tundra is today (Thursday). I have been on this trip 3 times now and just reading the report is very exciting and brings back great memories. Hello to everyone in Churchill, especially Myrtle!